We are very excited to be working with Wingtip Brewing Co and its fleet of innovative, international, world-class brands. Established in 2015 by the father and son duo of Chris, ex-flight simulator/computer expert and Simon Tripp, ex-drinks industry maestro, Wingtip Brewing Co is a UK travel based brewing company that commission their bespoke brews to suitable brewing partners around the globe, who are committed to consistency and first class quality. True to their air related theme, Wingtip do not see location as a hurdle; choosing the right brewery partner, wherever that might be and working with the top ingredients relative to the brew they are commissioning, is key to their successful beer range. The following new brews are all available on draught. Please get in touch for more details or to organise an installation. At 4% ABV, this air freighted lager is brewed at the Mannheim-Eichbaum, Germany; the oldest brewery in Mannheim dating back to 1679. Frequent Flyer has a malty aroma from the Two-Row malting barley sourced from around the Rhine and is well-rounded and lightly hopped with Hallertau hops making it hugely refreshing with a luscious finish. This 5% ABV low-visibility wheat beer bespoke brewed at Mannheim. A flavoursome and well-balanced style of the German classic, medium-bodied Cirrus 9 is fruity and aromatic with subtle hints of banana and clove, giving way to delicate spicy and citrus notes. At 4.9%ABV this dark wheat bier also brewed at Mannheim. A full flavoured, aromatic and distinctively flavoured beer, the malty notes and light fruity flavour lead into a taste that is beautifully tangy and mild with a slight bitterness on the finish. 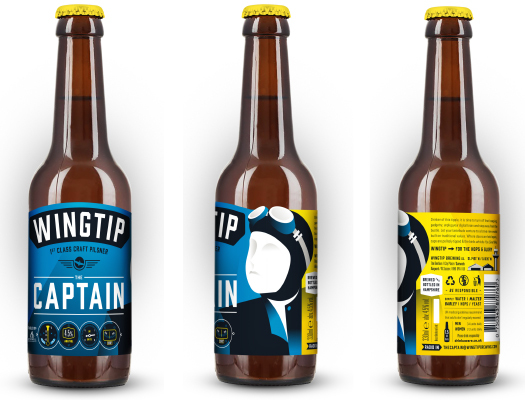 The Captain 1st Class Pilsner: is 4.5% ABV and available in 355ml bottles, bespoke brewed with Andwell in Hampshire. It is matured five weeks in tank with Czech Saaz and German Tettnang hops giving a floral hop aroma with distinctive grassy notes. The crisp finish and low-carbonation give it an easy-drinking style and lingering bitterness. T & C’s Apply: Installation of font offer available to bars willing to commit to selling any Wingtip beer a minimum of 18 months across the Wingtip range. *Aviation themed promotional event with support equipment including airline passenger seats & costume pieces, event advertising posters and beer prize for photography social media competition is available – subject to Wingtip 3 lines for the duration of the event. Enquire for more details.